Muay Thai fighter Ognjen Topic is light on his feet as he moves around the blue mats at North Jersey Muay Thai. The gym is relatively small, painted white, and composed of brick and concrete. As light pours in through the massive windows, the space appeared much larger and looked similar to the wide-open Muay Thai gyms in Thailand in photos. However, if one were to step outside, they’d see a gravel parking lot surrounded by the homes that make up the small borough of Lodi, New Jersey. Championship belts are stacked in a glass cabinet at the gym’s entrance, as the walls of the studio are lined with pictures of various fighters. They are alternated with photos of the head coaches, Kru Ray Cruz and Kru Joseph Bumanlang, posing with students or their instructors. A black hat in the corner of the front desk jokingly proclaims “Make Muay Thai Great Again”, while on the desk’s side in a black-framed bureau are liniment oils and hand wraps neatly lined up next to each other. The top of the bureau is adorned with a peaceful Buddha, flower garlands, a statuette of two fighters, and delicate pieces of cloth imprinted with Thai script. The entrance’s carpet floor, bright white walls, and binders lined up against the wall highlight that East meets West in this space. Just a few feet away in the actual gym, Topic is working with his pad-holder and teammate Michael Laserna, as they prepare for his upcoming headlining bout for Triumph Kombat at Madison Square Garden. Energetic and enthusiastic, the two men feed off of each other’s focus as the temperatures within the gym rise. They’re laughing as Topic jokes around, making faces while they’re exchanging kicks. He catches Laserna’s leg over and over again as he works his defense, and cuts to the side as he retaliates with a sweep. They’ve only been training for fifteen minutes, but puddles of sweat soon start to leave behind a trail of where they move on the mats. Despite the fact that Ognjen relatively keeps to himself, his Instagram boasts more than 75,000 followers and videos of his training sessions generate thousands of likes. 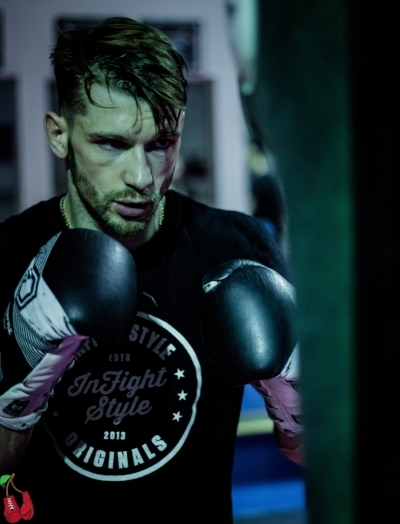 A graphic designer and artist, Topic has his two lives separated on social media–his fight page @TopicFight, solely shows his training and conditioning, while his business media @TopicCreative illustrates his designs and drawings. However, there is nowhere in the middle that showcases his personality. Friendly, warm, and ever-grinning, the fighter is well-aware that very few really know what type of person he is. Topic has done a lot. Ranked as the number one Super Featherweight Muay Thai fighter in the United States, Topic also holds the WKA and WBC North American championship belts. The former Lion Fight world champion has gained accolades such as the most “Fight of the Night” by Friday Night Fights and was the New Jersey Martial Arts Hall of Fame Fighter of the Year in 2012. He is also sponsored by InFightStyle, Onnit, and Clean Eats Meal Prep, all of which have merchandise and advertising bearing his image or logo. The fighter is not only a business, but a well-oiled machine. Only 31 years-old, Topic is looking to stretch his career out for as long as he is capable of doing. 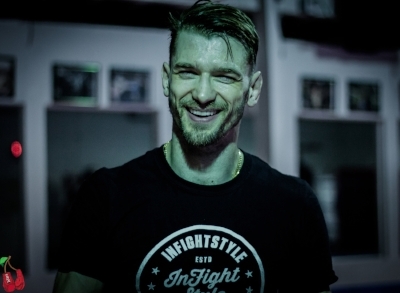 He began at Muay Thai at North Jersey Muay Thai in 2005 and then added training at Eminent Air Gym in Bangkok, Thailand. 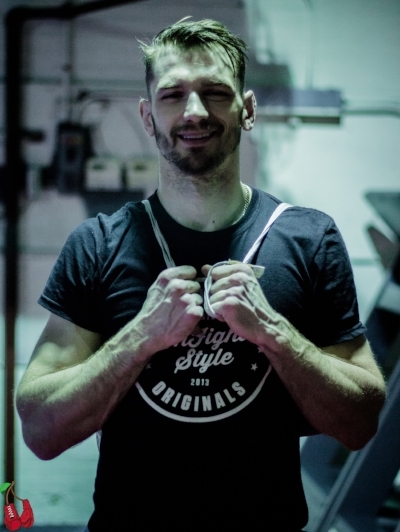 With his experience at both gyms, Ognjen strives to train and fight traditionally as possible. It’s fitting that his instructors were former scientists. Dissatisfied with their lifestyles, Krus Bumanlang and Cruz decided to open their own gym and travelled to Thailand in order to have an understanding of creating the most authentic Thai boxing gym in New Jersey. With a personality fitting of a neurosurgeon, Topic is also meticulous and dedicated to his craft. Knowledgeable about the sport and the fighters that came before him, he went to Thailand nearly ten years ago to simply get better as an athlete. It was his first time at the Mecca of Muay Thai that helped him recognize of how much he was capable of, as well as how to make his routine best serve him. Citing the great Buakaw and Saenchai as fighters he appreciates, Topic recognizes that he creates a lot of his own pressure. However, Ognjen is not intimidated to compete against the fighters whose tapes he was studying all those years ago. “I appreciate these fighters and learn from their styles because they are some of the best. Even though I lost to Saenchai, I still really admire him because he’s been in this sport for so long and has a technique that’s unlike anyone else. If I could fight him again, I would. A man with a mission, Topic feels he has begun his race against the clock. Many Muay Thai fighters begin in their adolescence, but his training started when he was 18. Even with his thirteen years of experience, the fighter is certain he has much more to accomplish. When asked about someday owning his own gym, he waves his hands and shakes his head. “One day,” Topic says with a smile. “But I don’t want to think about it. When I’m considering having my own gym, that means I’m near the end of my career and I don’t want to think about it yet. I’m always planning ahead but for Muay Thai, I don’t want to as much because I’m not ready for it to end. I want to be the best, I want to have meaningful world titles. I want to compete against the best.” He’s quiet for a moment and looks down, the smile on his face turning inwards as he reflects on what he just said. Topic sits on top of the mats, still sweating even though his training session finished long ago. Patient and playful, it’s a side of him that is not reflected online or by other media. Everything seems to focus on what he does in the ring, rather than the person he is outside of it. Students pass by and acknowledge him, or wish him well for his upcoming bout, which is the first time he’ll be fighting at Madison Square Garden. Topic carries this into all aspects of his life, including his passion for art. A graduate of William Paterson, he received his Bachelor’s in Fine Art and appreciates realism more than anything else. Ognjen stands after sitting for more than forty-fives minutes past his intense training session. He hasn’t had anything to refuel yet, placing all his energy on the interview. The sun has now begun to set and the light inside the gym darkens. He had worked with Michael, clinched with his coaches, and then finished on the heavy bag. It seems like his entire soul has been left on the mat, as a small ocean had drained out of his body in sweat. He looks tired but is still cheerful and maintains his amiable demeanor. A smile never really left his face as he spoke.